We’d love your help. 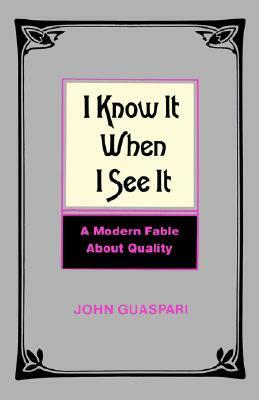 Let us know what’s wrong with this preview of I Know It When I See It by John Guaspari. To ask other readers questions about I Know It When I See It, please sign up. I loved this book. Really well done story for a business book. This was my brownie book through college. I use to give it to college professors , and they would like it and it was a quick read for them, and then they would feel bad for me and give me a C or C+. I highly recommend this book for its reading enjoyment, great business concepts, not to mention brownie using appeal, all wrapped up in cute little fable. Es una buena idea para hablar acerca de temas que, muchas veces, no son fáciles de abordar. Este es un cuento que habla sobre la calidad y su importancia en el éxito, ya sea laboral o personal. Además hay que tomar en cuenta que el autor está inmerso en el mundo empresarial y administrativo. Es un buen ejercicio. Me gustó mucho la idea de la fábrica "Puntuación S. A.". Creo que ahí está todo y se puede sacar más de ella. Se lee en un santiamén, pero no es una lectura imprescindible. narrative is good. message is good. refreshing half-an-hour read. Guaspari provides a quick read with a few gems of wisdom. I especially liked the corollary regarding mistakes and inspection capacity, but there were a few other related ideas that are nicely illustrated by this fable. In terms of criticism, the story is not that compelling and the main points, if summarized, would only fill an index card. I liked the book, found a few gems of wisdom, and would definitely recommend it as a quick leisurely read that helps to cement key concepts of quality. A funny little book that explains quality in a non-technical way. I have read a couple of these "Modern Fables" and this one was not so convincing. The point was too simple, too obvious to spend a whole book on. It should have been one point in a larger context. I could have just read the epilogue! But there was one nugget worth remembering.